Bake for a little less than directed because there is no oil. Top with sweetened strawberries and Coolwhip! Last week was hot and I had a ton to do each day. One night after dinner I was in the mood for a sweet treat that wouldn’t make me feel gross for eating it. I LOVE what I came up with. I searched frozen yogurt recipes and came across one of my favorite blogs: 101 Cookbooks . 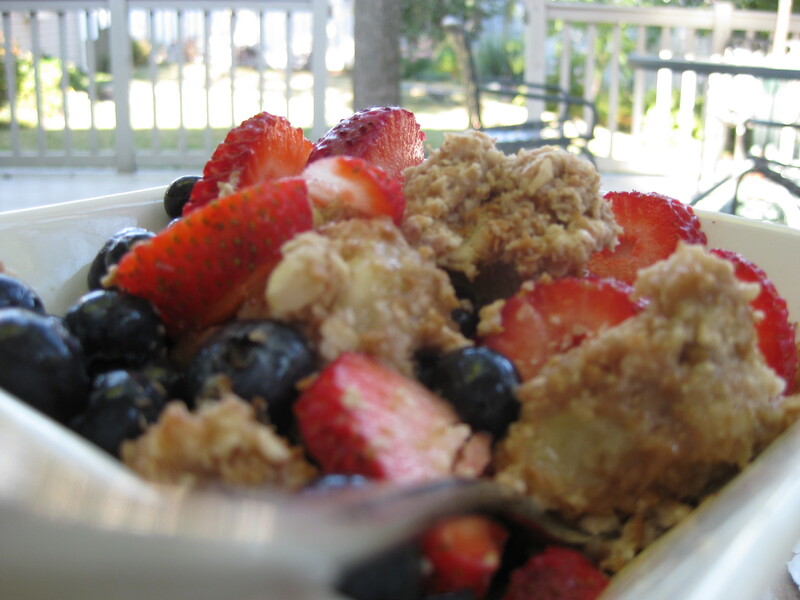 This blog of one of those go-to blogs full of great, healthy, natural recipes! Add berries and continue mixing until desired thickness has been reached. I ate mine with some almond butter drizzled on! This weekend while we were in Chautauqua we went strawberry picking! Strawberry season is in full swing in Western NY, so me, my mom, Papa and Grandma headed to the patch. *I must confess I made up the measurements to this recipe but I will double check on them tomorrow with Jen. Many of you know my theory, if you mix things that taste good together, it will taste great! Let me know what you think!